The meeting will be in the 'Aula Magna' of the 'Departamento de Física' of the University of La Laguna. 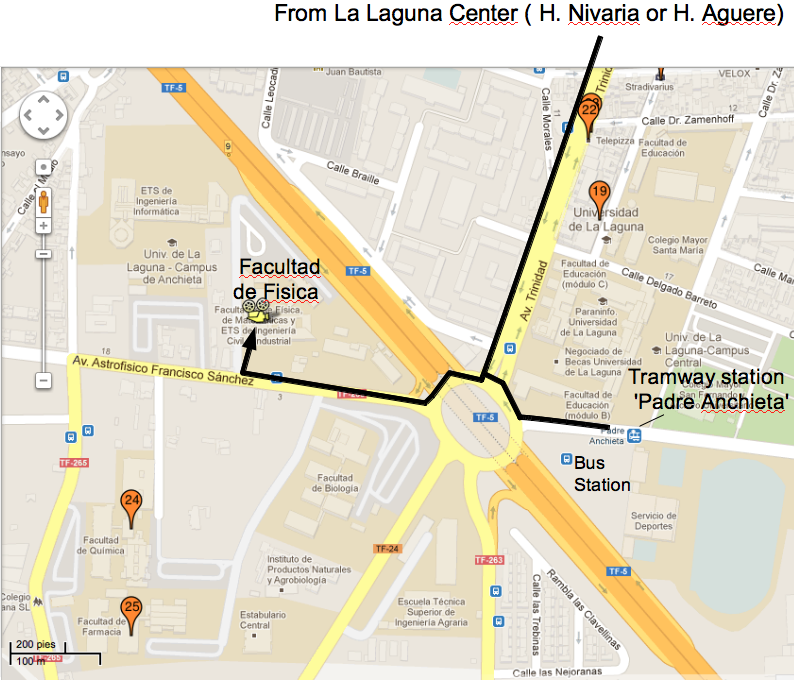 If you stay at a hotel in La Laguna, it is a 15-20min walk; try to get onto 'Avenida Trinidad', then see the map below (here a pdf of the same map). Up to 4 persons can also share a taxi, which should be 3-4€. Avoid to mention 'Astrophysics' to the driver as you will then likely end up at IAC, which is 2kms distant! If you stay in Santa Cruz, you would arrive by 'Tranvia' (Tramway; 30-35mins; exit at 'Padre Anchieta') or by bus at the La Laguna Bus Terminal. In both cases, go then shortly uphill to the large roundabout; about 400m to the venue. Tramway tickets are 1.35€ one-way or 6€ for 5 trips, to be bought at machines at each stop and be devalued after entering the train. Bus tickets can be bought at the driver. More info here for tramway and busses. Restaurants: The workshop will not provide meals besides coffee-breaks, which will be served in the Faculty Cafeteria directly below the meeting room. There you can also have a basic lunch or snack. If you want to eat in a different or nicer environment, you might try one of the places suggested here: interactive map, .kml of map (download to smartphone and take it with you!) . It provides also indications to many places in La Laguna center for dinner. When arriving at the meeting, please be prepared to tell us which of the visits you would like to participate in; payments will be due at the meeting. Thursday 21th of March: CW11 dinner, at the Restaurante Isla del Lago in Puerto de la Cruz. Bus leaves at 19:20 from venue and at 19:40 from Hotel Nivaria; return from dinner 23:30. Tickets for the dinner (choice: veal/fish/vegetarian) need to be purchased the first day of CW11 (45€, to pay in cash or credit card at registraton desk). If you are not there on the first day (19th) but want to attend the dinner please contact the LOC. Saturday 23rd March, full day:A hike down the Barranco de Masca, with a return to Los Gigantes by boat. The hike lasts about 4hrs including explanations, and goes downhill ~700m on rough terrain, until reaching a beach with possibility for swimming. The total price for the trip is 33€ (including transport, hiking guide, and some basic lunch =probably paella= on the boat), to be paid at the beginning of the trip (please foresee exact change). Each participant should carry a small pic-nic or snack, good solar protection, confortable hiking shoes, and enough water for the hike. And your favorite bathing suit, of course.